About 60 people took part in the Moscow May Day march in a pro-gay joint convoy of the Committee for Working International, the Left Socialist Action, feminists and the Rainbow Association (LGBT). On several occasions during the march they were attacked. The participants chanted slogans such as "capitalism fight - homophobia down," "down with fascism, homophobia, sexism," "no discrimination based on gender and orientation," "no discrimination - giving emancipation" and waved rainbow flags. 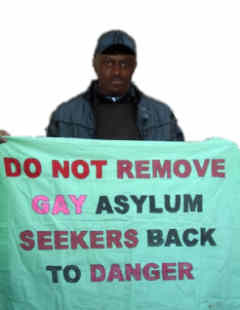 A source told Gayby.net that they were first attcked by a member of the Left Front, who tried to rip up a placard. 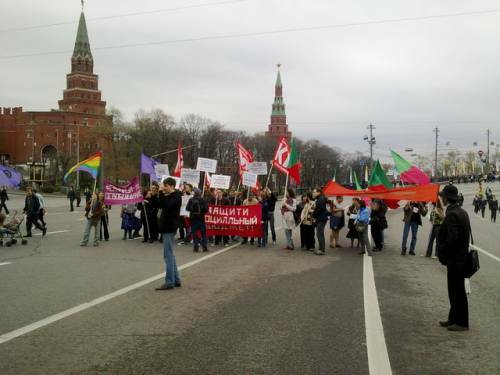 Members of the Left Front column were chanting homophobic slogans, but stopped after the intervention of the Left Front leader Sergei Udaltsov. Next, the group was attacked by Communist Party members, who tried to grab the marcher's rainbow flags. One of the protesters told Gayby.net that they were "especially aggressive".